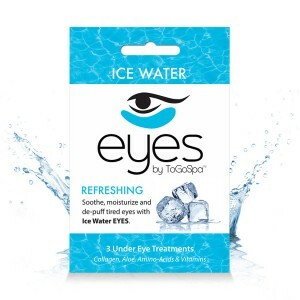 EYES by ToGoSpa (formerly known as Eyedews) are moisture packed collagen gel pads that provide instant, cooling relief for eyes suffering from dark circles, under-eye bags, fine lines, stress and fatigue, or to help you feel refreshed from a late night of too much fun, hangover, allergies or headache. The formula is made of a base of Marine Collagen (hello, cruelty free goodness! ), Hyaluronic Acid and vitamins C & E for cool soothing relief and natural hydration. My previous preferred method of calming cranky eyes on the go was spraying cotton pads with chilled rose water or using spoons that had been placed in a freezer. The problem with those methods is that the rose water would either be frozen solid or lukewarm when I needed it, and the cotton pads left fibers on the lashes or dripped. The spoons worked great–if you happened to have a pair of spoons and a freezer handy. Don’t get me started on old cucumber thing, I have enough to carry in my pro kit without toting salad ingredients on top of it all. These pads are one of the best solutions I have come across. For best results, simply pop them in the fridge or an ice bucket for a few minutes–both things you will have access to in almost any hotel, photo studio, or bridal suite–and apply to the undereye area to help reduce puffiness, redness, dark circles, and fatigue. Leave them on 15-20 minutes and you’re ready to go! So far this is the BEST CRUELTY FREE product for undereye circles. PROTIP: I like to get my clients a comfy place to recline with their head tilted back (but not lying flat) in order for the EYES pads to do their best work. Being reclined but upright allows for better lymphatic drainage which helps the body remove proteins and waste products and reduce swelling in the affected area, which is particularly important for Brides and other clients who will be photographed heavily or who are suffering from allergies, dehydration, or lack of sleep. The eye treatment is part of the prep work and usually I will apply a toning and hydrating mist to the skin as well as moisturizer using light circular motions during this part of the process before applying the EYES by ToGoSpa so that my clients feel relaxed and pampered while we perfect their canvas.